SINCE 1968, the Lokpal Bill has been presented in parliament for a total of eight times. All the eight versions have been very weak in terms of making corruption a heavily punishable offence. But even these diluted versions have not been passed so far as the Lokpal Bill intends to investigate political leaders of the country. The most recent draft of the Lokpal Bill put together by the present UPA government is completely ineffectual. Instead of empowering anti-corruption systems and checks and balances against the corrupt - it destroys whatever exists in the name of anti-corruption systems today. 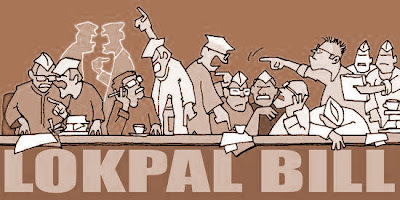 Presently, the Lokpal Bill aims to protect political leaders from any kind of action against them, which is why anti-corruption activists and organizations have suggested formulating a Jan Lokpal Bill. This Bill seeks to include the presence of members of civil society as founding members of the Lokpal Bill apart from representatives from the government. Representations by leading civil rights leaders and anti-corruption organizations led by Anna Hazare, RTI activist Arvind Kejriwal and rallies by Sri Sri Ravi Shanker and Yoga guru turned anti-corruption activist Swami Ramdev, have helped communicate the seriousness of civil society to form and pass the Jan Lokpal Bill. The Jan Lokpal Bill envisages the following to decrease, and ultimately remove corruption from the country. 2. Like the Supreme Court and Election Commission, they will be completely independent of governments. No minister or bureaucrat will be able to influence their investigations. 3. Cases against corrupt people will not linger on for years anymore. Investigations in any case will have to be completed in one year. Trial should be completed in the next one year so that the corrupt politician, officer or judge is sent to jail within two years. 5. If any work of any citizen is not done in prescribed time in any government office, Lokpal will impose financial penalty on guilty officers. The penalty will be given as compensation to the complainant. A citizen can approach Lokpal if his ration card, passport or voter card is not being made or if police is not registering his case or any other work is not being done in prescribed time. Lokpal will have to get it done in a month’s time. You could also report any case of corruption to Lokpal such as ration being siphoned off, poor quality roads being constructed or panchayat funds being siphoned off. Lokpal will have to complete its investigations in a year, trial will be over in next one year and the guilty will go to jail within two years. 6. There are also safeguards against the government appointing corrupt and weak people as Lokpal members. This won’t be possible because its members will be selected by judges, citizens and constitutional authorities, and not by politicians - through a completely transparent and participatory process. 7. Action will be taken if some officer in Lokpal becomes corrupt. The entire functioning of Lokpal/ Lokayukta will be completely transparent. Any complaint against any officer of Lokpal shall be investigated and the guilty officer dismissed within two months. 8. The Jan Lokpal Bill will appropriate existing anti-corruption agencies. CVC, departmental vigilance and anti-corruption branches of CBI will be merged into Lokpal. Lokpal will have complete powers and machinery to independently investigate and prosecute any officer, judge or politician. 9. It will also be the duty of the Lokpal to provide protection to those who are being victimized for raising their voice against corruption. The Jan Lokpal Bill will make costs and penalties of corruption prohibitive for those who are caught in corrupt practices. The Bill provides a methodical, transparent, and fair system to oversee day to day governance in terms of ethical dealings by government officials. It will also send out a strong message that the corrupt can no longer get away by politicizing cases of corruption and taking shelter of the influential as they themselves will be as liable if implicated.